performed by: Fred Astaire; Bing Criosby; Ethel Merman; Eddy Duchin; Benny Goodman; Artie Shaw; Frances Langford; Tommy Dorsey etc. These songs need no introduction, they are part of our heritage one can only wonder at the beauty of the music and the elegance of the lyrics. Think about the lyrics for 'In the Still of the Night' for instance (sung here by Jack Leonard with Tommy Dorsey -marvellously expressiove on trombone - and his orchestra): "
or will this dream of mine, fade out of sight, like the moon growing dim on the rim of the hill in the chill still of the night." All the artists featured were star names and most older listeners will recognise them. There is Mary Martin cheekily explaining that 'My Heart Belongs to Daddy'; Dinah Shore convincing one that 'You'd Be So Nice to come Home To'; Ethel Merman belting out 'I get a Kick Out of You'; and Bing Crosby persuading 'Let's Do It, Let's Fall in Love'. 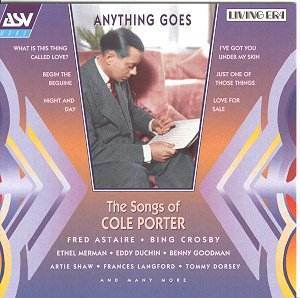 Cole Porter himself is inimitable, listen to his rendering of 'You're the Top'; so too is Fred Astaire singing 'Night and Day'. Hutch sings 'It Was Just One of those Sings' and that wonderfully expressive singer Frances Langford admits, 'I've Got You Under My Skin'; and you would be so 'Easy to Love'. One of Porter's darker more sardonic numbers is included, sung by Douglas Byng, 'Miss Otis Regrets'. Most of the recordings date from the 1930s with one or two from the late 1920s and several of the later tracks like Don't Fence Me In' sung by Bing and 'Always True to You in my Fashion' from the 1940s. A real treat and one that will certainly liven up long car journeys for me.